The T95X2 TV Box features the latest Android 8.1 OS which provides you with ultra-smooth and fast running experience and access to abundant Apps. You can enjoy 4k video output with the H.265 decoder. It features 4GB RAM and 32GB ROM so that you can store your favorite videos, songs, games, etc. Plus, it features 2.4G WiFi WiFi, you can browse websites and enjoy online TV programs, etc. 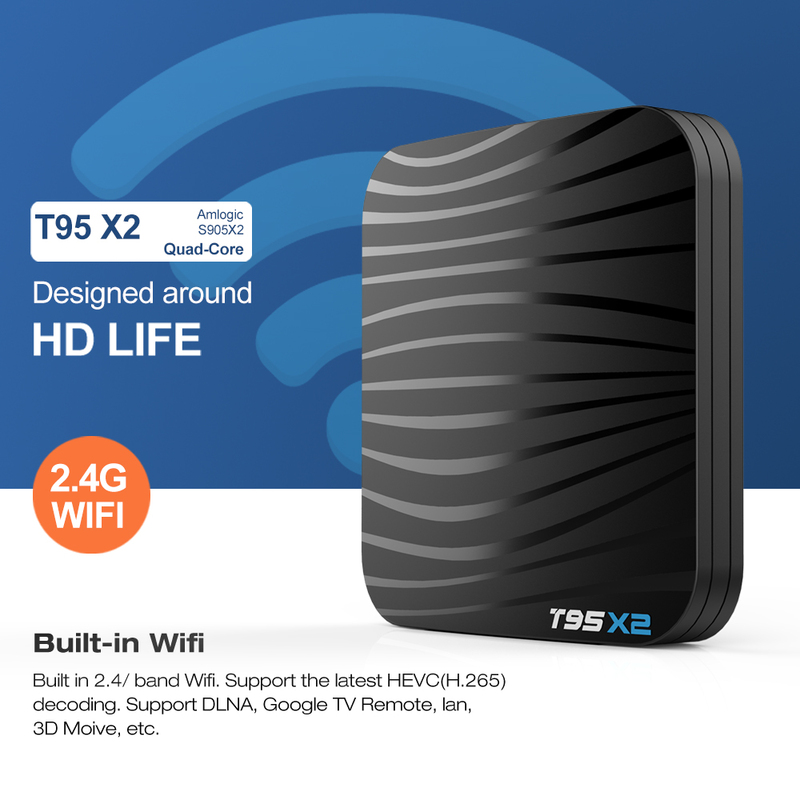 T95X2 TV Box is available in black color, which comes in the traditional rectangular design with curve edges and different ports on both sides of the device. it has some user interfaces, such as an AV Port, DC Power Port, HDMI 2.0 Port, RJ45 port, USB 3.0 port. The device is portable and lighter than must smartphone in the market today. 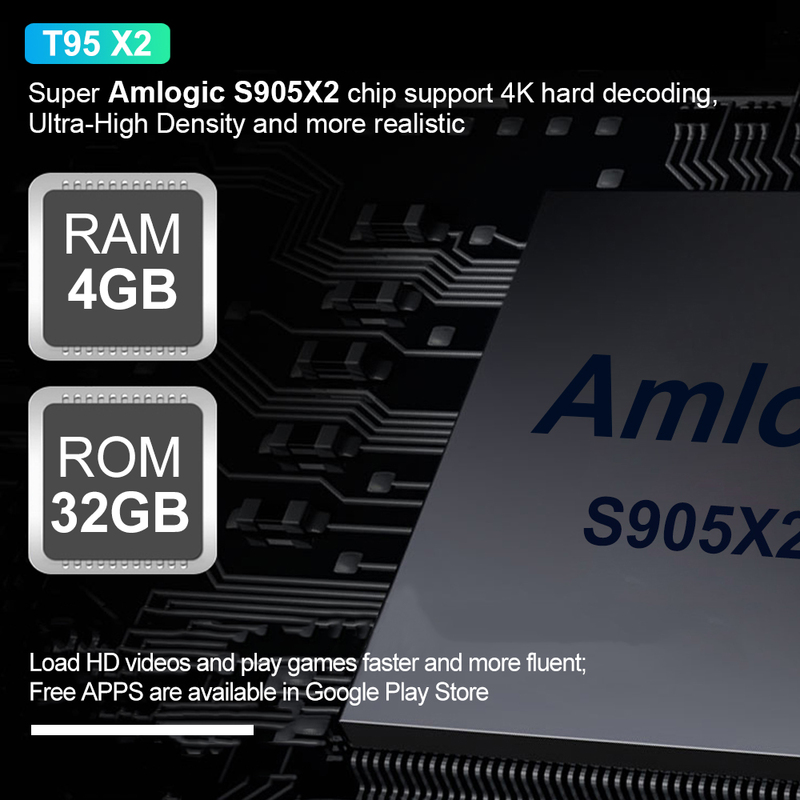 T95X2 TV Box is powered by Amlogic S905Y2 quad-core ARM Cortex-A53 CPU clocked at 1.8GHz with an ARM Dvalin MP2 GPU which handles its graphics and powerful for us to play videos fluently and fast. It is embedded with an LPDDR4 4GB RAM and EMMC 32GB internal storage. Meanwhile, if you think internal storage is not big enough, you can insert a TF card to expand it. T95X2 TV Box Supports 4K Ultimate HD video hardware decoding. With preinstalled Google Play Store and other apps, Strong WiFi Signal ensures transmitting strong signal in high quality and high speed. T95X2 TV Box uses for decoding the H.265 format. Supports video that are 4K, ASF, AVI, DAT, FLV, ISO, MKV, MOV, MPEG, MPG, RM, RMVB, TS, VOB, and WMV. From audio files, you can hear AAC, APE, DDP, FLAC, HD, MP3, OGG, TrueHD, WAV, and WMA. Supports also images that are in BMP, GIF, JPEG, PNG and TIFF format. A95X Plus Tv box features the latest Android 8.1 OS to provide you ultra-smooth and fast running experience and access to abundant Apps.